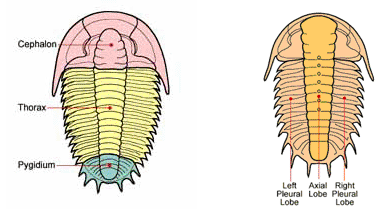 Trilobites, existing today only in fossil form, was a class of early arthropod. When life exploded into animal form marking the beginning of the Paleozoic, it was this prolific arthropod that became the signpost for the Era. It came into existence approximately 450 million years ago at the beginning of the Paleozoic Era in the Cambrian Period. It flourished in the ancient seas for close to 300 million years.So, what was this ancient arthropod and what about it inspires such fondness among students of all ages? Could it be its unusual body armor that allowed for unique defense mechanisms? Perhaps it’s the almost friendly appearance, with its prominent “face.” Or is it simply because of its broad diversity among the remnants of a long extinct species? A close look at this ancient creature reveals a certain familiarity, sharing characteristics with modern-day species known to us all. I’ve already mentioned that it was one of the first arthropods. Arthropods still exist today, of course; they are those creepy, crawly bugs that invite themselves to our picnics (ants, spiders, mosquitoes, and the like) or the crusty seafood delicacy that occasionally graces our tables. (Take your pick, shrimp, lobster or crayfish: all arthropods!) The trilobite earned its place among the arthropods because it had a hard exoskeleton, a body that had at least a couple of sections, and jointed legs. It’s pretty easy to observe the hard exoskeleton in a trilobite fossil. It’s the part that turned to stone! That process is another whole story, but the important part is that in this arthropod, the exoskeleton was so distinctive that paleontologists use the characteristics to help place these animals into different groups for classification. More on that a little later… For now, lets look at the segmented body. There are three easily identifiable sections: the head or cephalon, the thorax, and the pygidium or posterior section. One might suspect this arthropod to be named for these three sections, but it was not. Its name, means three-lobed, referring to the three lobes that run head to tail: an axial lobe through the center and two pleural lobes on either side, left and right. This 3-lobed characteristic is common to all species of this class of arthropod, even though the appearance of the three body sections can vary greatly. The matter of jointed legs was not as easily determined. The legs were softer than the exoskeleton, even if they were somewhat crunchy, so they didn’t tend to preserve well. 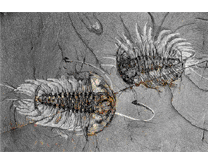 Luckily, there have been a few specimens found that showed those legs and some antennae, too.2 There are only a couple of places on earth (so far) where trilobites were fossilized showing their legs: the Burgess Shale in western Canada and the Chengjiang in China. Something about the circumstances of burial must have been similar for these two distant places to have made such detailed preservations. Are you looking buy trilobites.? Fossilicious.com has a wide selection to choose from.